Last Monday, Chris and I ventured into Glendale so I could finish up some requirements needed for my job. We had gotten there really early; by the time I finished, we were both hungry. I opened the Yelp app on my phone and discovered there was an Eggslut location just a block away! After begging Chris to try it with me, we made our way to the place. Eggslut was founded in 2011, for the love of eggs! The key ingredient to their sandwiches are eggs (obviously). They’re mostly a breakfast/brunch place but some locations are open until 7 or 8 at night. When we arrived, the place was rather empty. But by the time we had finished ordering and found ourselves a table, the restaurant was filled. Chris got the bacon, egg & cheese sandwich with a side of avocado. His sandwich was made of hardwood smoked bacon, cage-free over medium egg, cheddar cheese and chipotle ketchup in a warm brioche bun. I got the fairfax, which came with cage-free soft scrambled eggs and chives, cheddar cheese, caramelized onions and sriracha mayo in a warm brioche bun. I added avocado as well but substituted the sriracha mayo with their honey mustard aioli. The sandwich was delicious. I wasn’t crazy over the honey mustard aioli but overall, it was a good sandwich. Rather messy with the eggs falling everywhere, but I think that was the point of it. Rate 10/10 will visit again if I was in the area, or close to one. Damn, that place looks good! And I laughed at the name, it's pretty clever. It's neat that they have burgers and sandwiches all with eggs, I feel like I never have eggs when I'm out unless it's for brunch. They gotta open that place in New York! Even though I waited a couple of years for Eggslut (and shake shack) to open in Glendale, I still haven't made the effort to try it out yet XD. It's pretty neat that their focus ingredient are eggs. Their menu items sound super delicious. I probably wouldn't be crazy over the honey mustard aioli either, but it sounds better than the sriracha mayo. 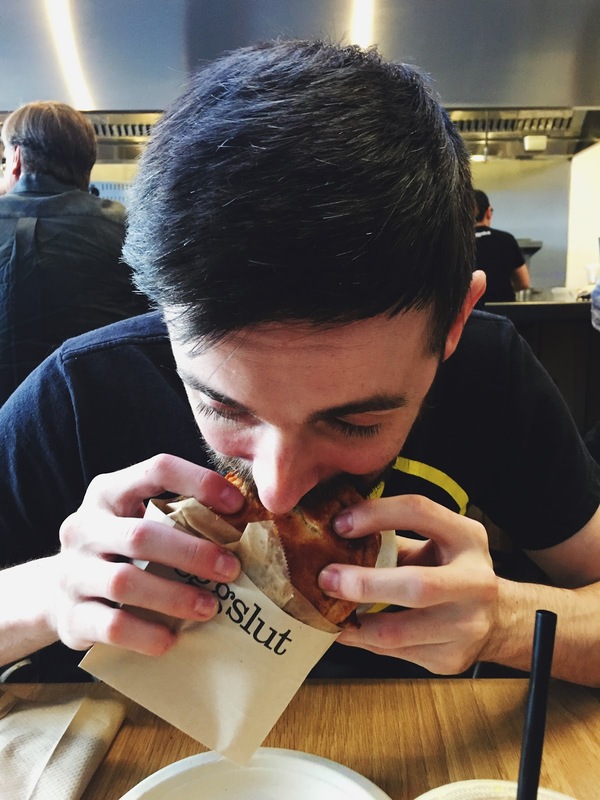 Hope Chris enjoyed Eggslut as well! It's my first time in your blog too, and I must say, it looks very aesthetically-pleasing! Haha. I really have this thing for minimalist styles. ❤️ And btw, those egg sandwiches look really good, I wanna make one for my breakfast! OMG. I love eggs more than any food — which is very strange to most of my friends. I would die if they had this restaurant by me…maybe when I travel to LA next. 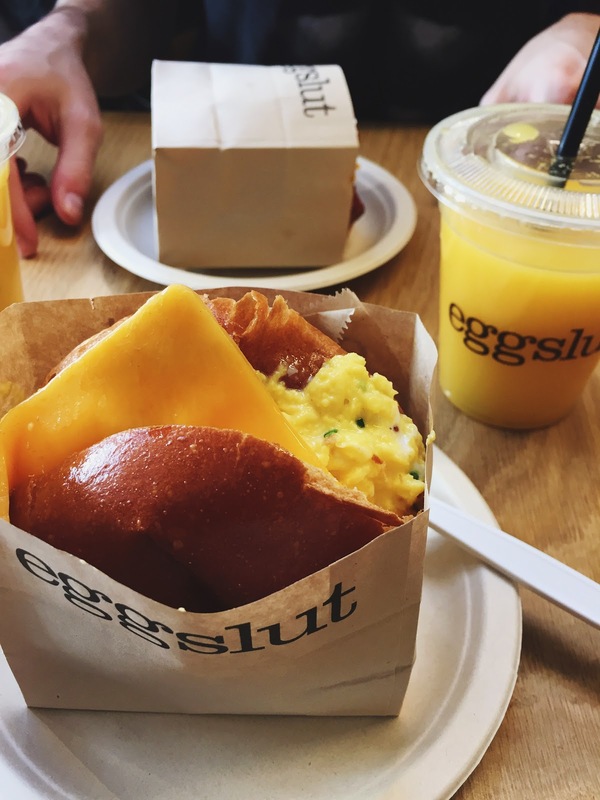 I have heard good things about Eggslut and the sandwiches look so so tasty! Did I giggle at the title? No. Maybe . . . yes. 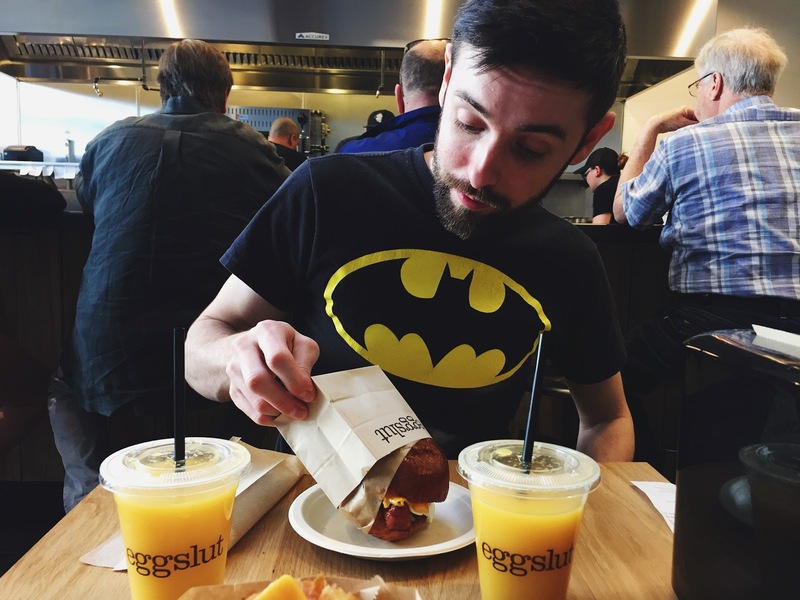 I need to go to Eggslut. I LOVE eggs, but my boyfriend doesn't eat them at all. Every sandwich needs an egg. Fact. Oh my gosh, this place looks amazing! The food looks so delicious! The food looks good Eenaaa!!! I'm a sucker for breakfast places and this I wish could come to Philippines. <3 I preferred scrambled eggs over sunny side up so seeing what you ordered really made me drooled and crave for bacon and eggs! I live for eggs, especially scrambled eggs (literally, because it's one of the few things I know how to cook lmao)! The Fairfax looks so delish 💖 What kind of drink did you order to go with it? 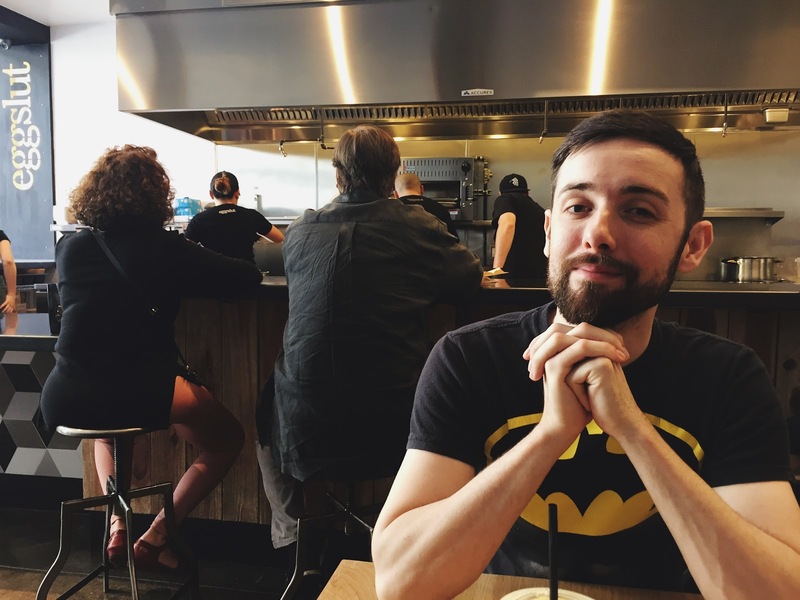 Love Chris' Batman shirt btw! I really LOVE reading your blog. The posts are written short and the images make up for it. 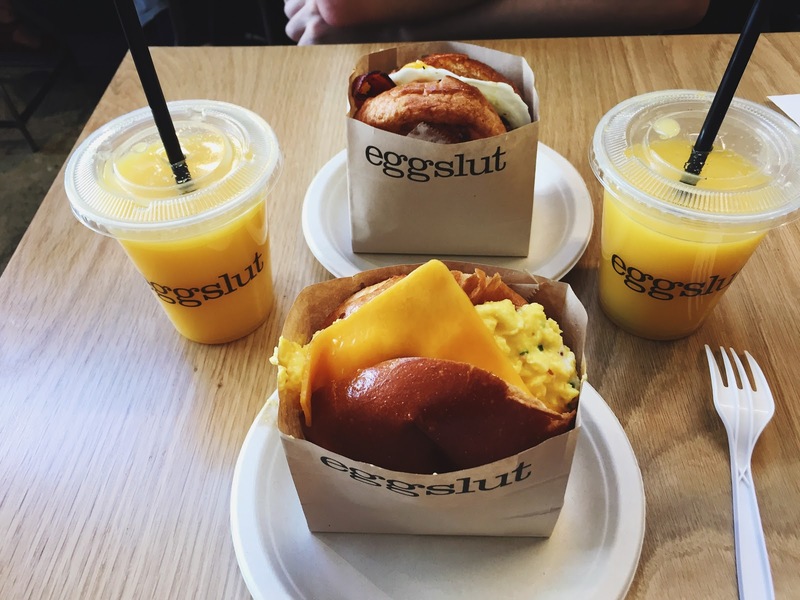 I've been loving eggslut ever since they opened the first location in LA. I also always make sure to go when I'm visiting Las Vegas. I didn't know they had a Glendale location! I'm glad that you guys enjoyed the sandwiches! Yummm! It looks really good. I need to hunt it out when I'm next stateside! but!!! your!!! fairfax!!! looks!!! heavenly!!! Oh man, that's a real good logo! It really does leave an impression! Everything looks yum too.I love eggs so I'd go head over heels with those. OMG I LOVE EGGS SO MUCH. Especially egg sandwiches. *heart eyes* I'm drooling!